We had some big news in Southern California this week – rain. Sure, those of you living in other areas may laugh. However, stormy weather is news for us. It was the top story across most networks. Even Jimmy Kimmel poked fun at our rainfall coverage. Although, driving on such days is no joke. Traffic worsens and accidents increase. Not the ideal time for a cupcake mission. Yet, I persevered. My destination: Isabella’s Cupcakes & More in Riverside, California. Receiving solid reviews on Facebook and Yelp since opening in March 2014, I thought it worth the trip. I arrived during a lull at the shop. This worked to my advantage, as it soon became clear I needed more attention than usual. Their large cupcakes had a general description. But by requesting details, I learned of their preference for Swiss Buttercream. Instantly, I looked at the mounds of frosting differently. As a meringue buttercream, I knew it wouldn’t be as sweet. We then discussed my love of American Buttercream, and which flavors might be better for me. By the time our talk ended, it was Cupcake Happy Hour. My selections were only $2.75 each instead of the regular price $3.50. Later at home, I approached the Peppermint Bark. Back at Isabella’s Cupcakes, I danced around this one. You see, though a holiday classic, I’m not a fan. 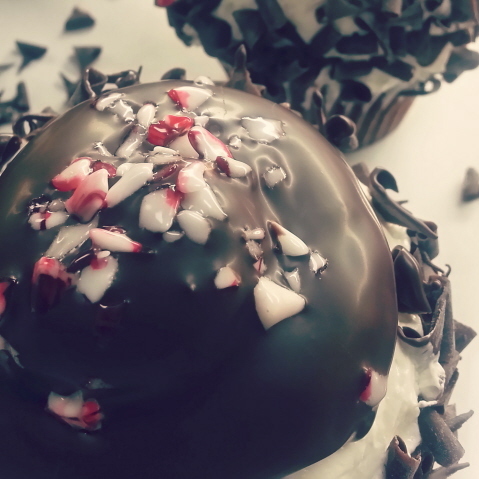 Still, with its festive peppermint garnish, this cupcake brazenly challenged me. Also, I was advised the Swiss Buttercream was topped with a chocolate candy coating, not simply a ganache. Stepping out of my comfort zone reaped dividends. The chocolate cake was moist with a hint of peppermint. With each bite, I chipped away at the mountain of fluffy frosting. Enjoying its subtle crunch from grains of peppermint candy. Then, there was extra frosting in the cupcake’s center. Coated with rich chocolate and rimmed in chocolate curls, the Swiss Buttercream was enough to satisfy. In fact, American Buttercream would’ve been too much. Surprised by my acceptance of this fact, I looked at my next cupcake, Salted Caramel. This came recommended at Isabella’s Cupcakes. Not only is it a favorite among customers, but also the caramel should be sweet enough for my buttercream penchant. Soft and sumptuous, the generous frosting exceeded my expectations. 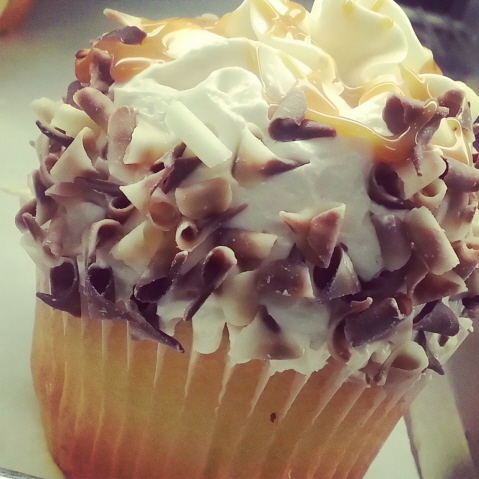 Ribbons of caramel along the top and in the cupcake’s middle enhanced its flavor. And the touch of salt was just right. The vanilla cake was pleasant. Truth be told, I’m not sure how it would stand on its own merit, but it worked well with the caramel. Afterwards, I deliberated over the rating. It was another case where increments would be useful. Nonetheless, since 3.75 will not suffice, we’ll round up to 4 stars. Isabella’s Cupcakes has turned this Frosting Fanatic into a supporter of Swiss Buttercream – an admirable achievement. Glad I didn’t let the rain interfere with my mission. Some days you just have to create your own sunshine… That’s easier to do when you have cupcakes. Previous: Previous post: Is Crumbs Worth Another Try?